In a paper published today in the journal Nature, the AWAKE collaboration reports the first ever successful acceleration of electrons at CERN, using a wave generated by protons zipping through a plasma. The acceleration obtained over a given distance is already several times higher than that of conventional technologies currently available for particle accelerators. First proposed in the 1970s, the use of plasma waves (or so called wakefields) has the potential to drastically reduce the size of accelerators in the next several decades. AWAKE, which stands for “Advanced WAKEfield Experiment”, is a proof-of-principle compact accelerator project for accelerating electrons to very high energies over short distances. Accelerating particles to greater energies over shorter distances is crucial to achieving high-energy collisions that physicists use to probe the fundamental laws of nature, and may also open up completely new industrial and medical applications. Plasma is a special state of matter that can be induced by ionising a gas – that is, by ejecting electrons from the gas atoms or molecules. In AWAKE, rubidium is heated to convert it into a gas and is then ionised with a laser beam. A proton beam (called the ‘drive beam’) is injected along with the laser pulse and causes the plasma to oscillate in a wavelike pattern, much like a ship moving through the water generates oscillations in its wake. AWAKE gets its drive-protons with an energy of 400 GeV (billion electronvolts) from CERN’s Super Proton Synchrotron (SPS), which is the last accelerator in the chain that delivers protons to the LHC. A beam of electrons (called the witness beam) is injected at a slight angle into the oscillating plasma and gets accelerated by “surfing” plasma waves. On 26 May, the AWAKE collaboration successfully accelerated witness-electrons for the first time. Electrons injected into AWAKE at relatively low energies of around 19 MeV (million electronvolts), “rode” the plasma wave, and were accelerated by a factor of around 100, to an energy of 2 GeV (billion electronvolts) over a length of only 10 metres. Several UK-based research groups are part of the international AWAKE collaboration and supported by the Science and Technology Facilities Council (STFC) within the AWAKE-UK project. They are led by Professor Matthew Wing from UCL and are making a number of important contributions to AWAKE. This includes the booster section of the initial electron line, simulation studies into the beam and plasma dynamics, as well as beam monitors to fully characterise the initial and accelerated electron beam. These contributions help fully understand and optimise this novel accelerating scheme. AWAKE has made rapid progress since inception. The plasma cell was installed in early 2016. 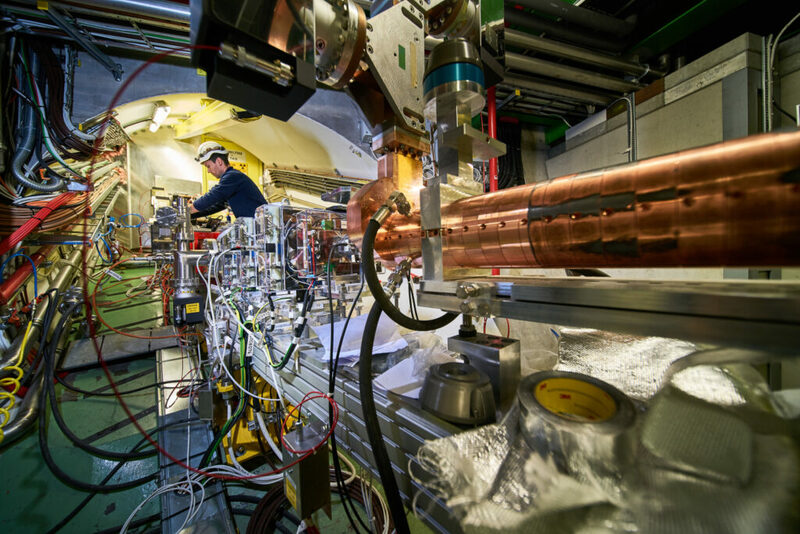 A few months later, the first drive beams of protons were injected into the plasma cell to commission the experimental apparatus, and a proton-driven wakefield was observed for the first time in late 2016. The collaboration will now carry out detailed studies into this novel accelerating scheme with the aim to further optimise the beam-plasma interaction and achieve even higher gradients. This is very important to fully understand the potential of this new way of accelerating electron beams. The animation describes how the Advanced WAKEfield Experiment (AWAKE) achieved the first ever acceleration of electrons in proton-driven plasma waves. In this experiment, a 10-metre plasma cell is filled with rubidium gas (pink), supplied by two flasks, and controlled by changing the temperature. A proton beam (red line) from CERN’s Super Proton Synchrotron (SPS) enters the plasma cell together with a laser pulse (green). The rubidium gas is transformed by the laser into a different state of matter, called plasma (yellow) and the long proton beam splits into a train of short micro bunches, which create the accelerating plasma waves (wakefield). Bunches of electrons (witness electrons, blue circles) are injected, captured by the plasma waves and accelerated to high energies, like a surfer riding a wave. This technique might offer a new way to build small-size high-energy particle accelerators and enable an entirely new range of particle physics experiments.